These exercises teach the children various skills, for example, tying their own shoelaces or buttoning their coats. Care of the environment is also promoted and involves learning such skills as laying a table, planting seeds and care of pets. These learning activities are designed to promote independence, concentration, social-skills, self discipline and to develop motor skills and co-ordination. These are the "building blocks" which form the foundation of a child’s learning, each exercise being performed in a ordered sequence. The aim of this sequence is to promote "top to bottom" and "left to right" in preparation for reading and writing. The sensorial philosophy is based on the fact that we build a knowledge of the world through our senses. These learning activities are designed to teach the child through stimulation of each of the fives senses. This enables the child to understand new concepts through experience and exercise. Starting with a basic task, the child builds on this and gradually moves on to more complicated tasks. In doing so each sense is isolated in order to create a memorable experience. The special Montessori equipment is designed so that the child can correct his/her own mistakes, thus promoting independence. 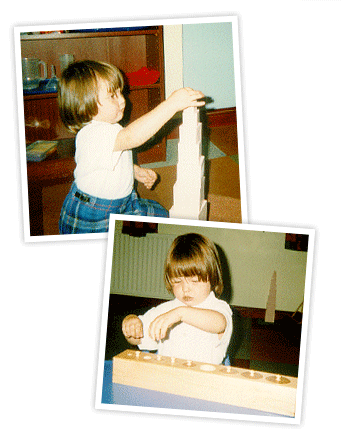 Many of the exercises help to develop the child’s muscular co-ordination and fine / gross motor movements. Whilst performing these exercises the child is taught the appropriate vocabulary for each new skill acquired. This further helps the child’s development of language. Language skills involve listening, speaking, reading and writing. Initially a child’s language is developed through stories and poems, rhymes and action songs. Games involving questions and answers are also used to broaden language skills. The children have access to a library and are encouraged to appreciate books, either being read to them, or during individual "quiet" periods. A child is taught how to recognise the shape of letters in the alphabet through the use of sensorial equipment (sandpaper letters). Using this method the child "feels" and "sees" the letter shape whilst learning the "phonic" sounds associated with each. Once letters are recognisable the child is taught basic three letter phonic words (such as dog, hat, tin) through use of the phonic reading method. Many of the practical life and sensorial exercises encouraged a logical approach. Each task having been taught in an ordered way, carried out carefully and always completed. The above forms the foundation of the Montessori approach to arithmetic. A child is introduced to early counting through the use of number songs to promote their understanding of the numbers one to ten. They are then taught to recognise the quantity and the written symbol. Each exercise builds on their knowledge in order for them to understand the concepts of addition, subtraction, multiplication and division. "The Arts" normally include literature, music, the visual arts (e.g. painting) and the performing arts (e.g. drama). Literature is fundamental to the child acquiring and developing language. All children need the stimulus of quality stories and poems as these include a wide range of language and enable the child to explore human experiences and varying cultures. Music education has an important role in the development of the child. Music helps develop emotions and expression. The Montessori method develops musical appreciation through training the child to listen and develops emotional response to music through movement. Visual Arts encourage self-expression and provides opportunities for intellectual, physical, social and emotional development. Within the Montessori classroom the child’s creativity is encouraged through the use of paint, crayons, collage and paper. Performing Arts are where the child is made aware of the potential movements of his/her body and of the basic parts that can be moved. In doing this the child is taught basic activities such as stepping, jumping, turning. They are also taught the basic shapes that can be made by the body and how to move "in time". In our school the children have the use of large outside apparatus and smaller apparatus, for example, hoops, balls and beanbags. Children are never too young to be introduced to the basics of information technology ! The Montessori methods for teaching language and arithmetic skills are reinforced through carefully selected software packages that run on our multi-media Pentium Computers. These activities also benefit the child’s fine motor skills through his / her use of a "mouse" and keyboard.